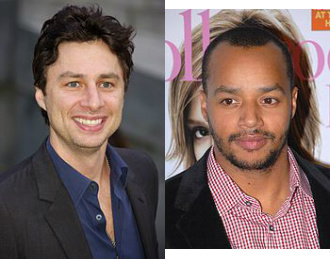 Characters from the show “Scrubs”. This week they start again: “conferences”, which, in the Arts Faculty lingo, refer to smaller classes that give undergraduates the opportunity to discuss course readings and assignments. These conferences are led by teaching assistants, usually graduate students from the relevant faculty, who guide discussions and answer questions. Conferences can be pretty demanding, and how TAs cope with the vagaries of teaching life varies. Having been a TA for a while, I have come to realise (imagine?) that the various “types” of TAs around match the wide variety of characters that the relatively famous (and brilliant!) American medical comedy series “Scrubs” puts on display. The series’ characters are all odd in their own ways, much like us TAs, and all get to teach doctors more junior than them, a task they carry out in a variety of styles. So, want to know what kind of TA you are (or have in front of you)? Read on for an introduction to the staff of the hospital! (pardon: the university). The Turk TA (J.D.’s friend, medical intern): the Turk TA also cares about what others think, but that is less awkwardly obvious than in the case of the J.D. TA. Instead, the Turk TA is just cool by nature, puts people at ease, and can chain-teach several conferences without breaking a sweat. That energy might sometimes be overwhelming, though, and it does occasionally overshadow the actual substance of what is to be learned. Nevertheless, good times are certainly to be had with her/him. The Reid TA (J.D.’s friend, medical intern): the Reid TA can be quite friendly, engaging, and helpful, if she/he is met on one of the good days. Most of the time, however, the Reid TA is stressed and burdened by self-doubts about whether she/he has the skills to complete the day-to-day tasks and assignments. As a consequence, the Reid TA will occasionally forget to look after her/himself (the disorganized hair being but one sign), and/or forget a meeting, before running hurriedly to get there in time. Fortunately, the Reid TA is actually quite good at the job, and indeed rather likeable, although she/he will be the last to realise it. The Cox TA (senior doctor): the Cox TA has been around far too long, has seen it all, and, as a natural consequence, also knows it all. Students do not scare her/him: much the reverse. Lessons and knowledge are delivered through belittling, exasperated comments, and indeed, the Cox TA values fear over respect, although she/he is very much certain to inspire both. On that point the Cox TA is correct, for she/he is indeed an expert at the job, whose comments hurt only because they ring so true. Rumours even have it that the Cox TA actually cares about students, although such feelings are hidden beyond a thick veil of bitter cynicism. The Kelso TA (hospital director): much like the Cox TA, the Kelso TA delivers comments in ways that can be funny, but at the expense of the receiver. Unlike the Cox TA, there are no rumours about the Kelso TA’s hidden feelings: there are none. The Kelso TA simply does not care, or at least not for the students: she/he is in it for the money, and makes no effort beyond what is of direct personal benefit. Whether the Kelso TA is actually much of an expert in the field is unclear, but does it matter? She/he holds a position of authority, and that should be plenty enough to keep annoying people at bay, and get by without too much effort. The Espinosa TA (head nurse): last but not least, the Espinosa TA is frank and outspoken, and gives clear and sensible instructions. This straightforward approach earns her/him respect, and makes for an effective learning environment. The Espinosa TA is also caring and supportive, although some perceive that behaviour to be over-controlling and paternalistic. Nevertheless, the approachability and frank advice make the Espinosa TA a popular mentor, who is always ready to offer extra support even when she/he is on a tight schedule. Next Post What type of procrastinator are you?